was a Red Sportiva Coupé, it was up on blocks and looking a bit sorry for itself, there were no registration plates visible. Ashingdon, near Rochford, Essex and would have looked similar to the Ashley Sportiva above. a barn, the rear view only and I have it down as a white Sportiva (I guess it could equally have been an 1172), it did however have a square rear number plate type body, similar to the Ashley Sportiva below. I looked for it but there was no sign of it. gypsies might take it away). laying in the same place on its side. and I can't remember which it was now. I often wonder if the Ashley is buried there! " in the forum post "Identity of field find"
over this winter the tarp cover has blown off. but wish to identify the car if anyone can help me. It's not a Gilbern GT, having 2 Gilberns myself I've checked this. 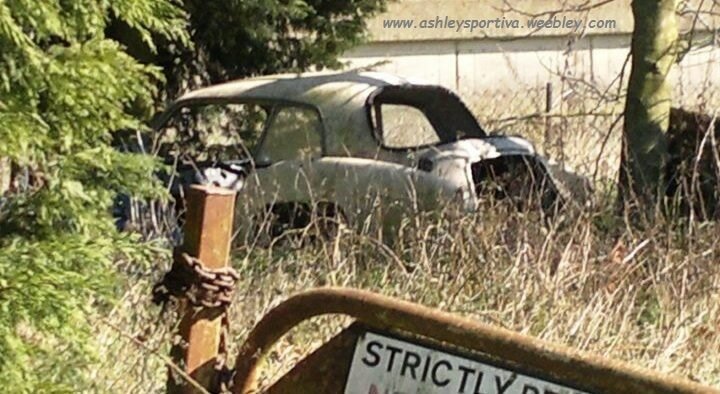 I believe it's location is in Lincolnshire and the forum deduced that it is an Ashley Sportiva. Is it still there or gone to be saved I wonder? ​Another Ashley Sportiva (or maybe an 1172) was seen by Martin @ (Odd's Oracle) on the internet on 30th January 2015, with this photo below posted by "Odd".